An advisor to Gaza premier Ismail Haneyya has affirmed that Egypt was playing an important role in the Palestinian reconciliation process. Esam Da’alis, a special advisor to Haneyya, told the PIC reporter on Saturday that the Palestinian government was always in contact with the Egyptian leadership concerning developments of the reconciliation. The advisor expected improvement in relations between Egypt and Gaza in the coming few days, adding that the Egyptian media campaign against Hamas had come to an end. He underlined, however, that the media incitement did not obstruct contacts with Cairo. The Egyptian intelligence apparatus had supported the recent meetings in Gaza, which culminated in declaring national reconciliation, and allowed Dr. Mousa Abu Marzouk, who lives in Cairo and who heads Hamas delegation to the reconciliation talks, to cross into Gaza to attend the meetings in another indicator of an Egyptian support for the reconciliation talks. The Palestinians living in Europe welcomed the Palestinian reconciliation agreement and said it must be based on upholding the national constants, especially the Palestinian refugees' right to return to their villages and towns they were expelled from in 1948. 17 Palestinian organizations operating throughout the European continent stated in a press release that it had received the news of signing the reconciliation agreement between Hamas and Fatah with great happiness. They said they are optimistic that the Palestinian parties are able to solve all contentious issues and execute what they have agreed upon. The Palestinian groups expressed their hope that the Palestinian political forces in the Palestinian arena alongside the Arab countries would provide every support for the success of the reconciliation agreement on the ground. They stressed the need for restructuring the Palestine liberation organization (PLO) based on election to have leadership representing the Palestinian people at home and abroad. Their statement strongly denounced the US for opposing the Palestinian reconciliation agreement and described its position as a flagrant violation of international norms and values. They also invited all Palestinians in Europe to attend the 12th Palestinians in Europe conference slated to be held in the French capital Paris on the third of next May. In a related context, professor of political science at Najah University in Nablus Abdul-Sattar Qasem said that the peace talks with the occupation would waste the Palestinian rights, while the Palestinian reconciliation agreement would help restore them. Qasem added in press remarks to the Palestinian information center (PIC) that Israel's economic sanctions against the Palestinian Authority is a good chance to get rid of its economic hegemony over the Palestinians. 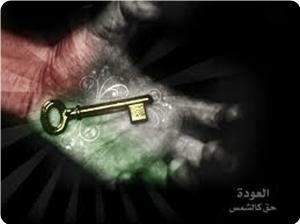 He stressed that the Palestinian people are ready to pay the price of freedom no matter what happens. Israeli Housing Minister Uri Ariel has called for boosting settlement construction in occupied West Bank following a reconciliation deal between Palestinian rival factions Fatah and Hamas. 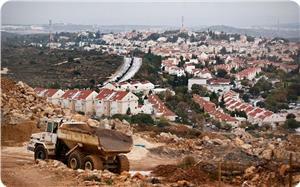 "Israel should resume construction projects in the settlements and seek to impose its sovereignty over the areas (C) in the future," Ariel said, according to Radio Israel. According to a report issued by the UN Office for the Coordination of Humanitarian Affairs (OCHA), area (C) constitutes 60% of the West Bank territories where about 300 thousand Palestinians live. In the same context, U.S. President Barack Obama described PA Chairman Mahmoud Abbas's decision to form a unity government as "unhelpful" and would undermine negotiations with Israel. Obama said on Friday that a pause in peace talks between Israel and the Palestinians may be needed so both sides can consider the alternative to negotiating. He stressed, however, the importance of peace talks between both sides. On the other hand, US State Department said that Abbas promised in a telephone conversation with U.S. Secretary of State John Kerry that the new government that will be formed following the Palestinian reconciliation will recognize Israel. 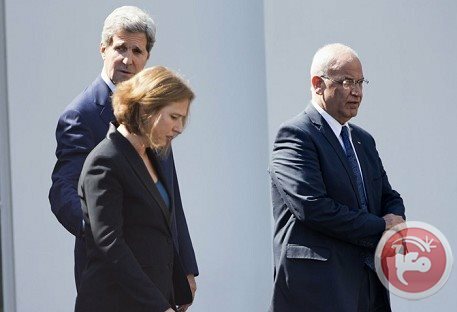 Abbas told Kerry that the future unity government with Hamas will be his government and represents his policies – it will recognize Israel, abide by past agreements and will renounce violence, US State Department spokeswoman Jen Psaki said. “We are in a holding period where parties need to figure out what is next," Psaki added in a press conference regarding negotiations. "We have always thought there could be a point where we needed to pause and both sides needed to look at what was possible. And we're clearly at that point now", she clarified. In their turn, leaders of the House of Representatives’ Appropriations subcommittee that oversees foreign aid Reps. Kay Granger, a Republican, and Nita Lowey, a Democrat, said the agreement clearly threatens the money the Palestinian Authority has grown accustomed to receiving. "This is an irresponsible path forward and this agreement should be abandoned immediately if the Palestinian Authority is serious about the peace process," Granger said in a statement. Lowey said she would be working with the State Department on the logistics of suspending aid unless Palestinian President Mahmoud Abbas reverses course. For his part, Senator Lindsey Graham called the Palestinian Authority's move a "provocative act", and said he hoped Congress "will take a forceful stand against this decision." But in another tone, Imam and preacher of Al-Aqsa Mosque Sheikh Yousef Abu Sneineh has welcomed Palestinian reconciliation agreement, calling for its immediate implementation. During his Friday sermon, Sheikh Abu Sneineh stated that this agreement is an initial step to end the division and unify Palestinians' efforts in face of Israeli occupation. On the other hand, he denounced Israeli violations and break-ins against occupied Jerusalem and al-Aqsa Mosque, condemning Israeli racist restrictions on Palestinian worshipers' access into al-Aqsa Mosque. Sheikh Abu Sneineh called for paying attention to Jerusalemites' daily suffering due to Israeli Judaization schemes and confiscation policy. He also called for the release of Palestinian detainees who are exposed to torture and maltreatment in Israeli jails. President Mahmoud Abbas said Saturday that he remains willing to extend peace talks with Israel, which halted the talks in response to a Fatah-Hamas unity deal signed earlier in the week. 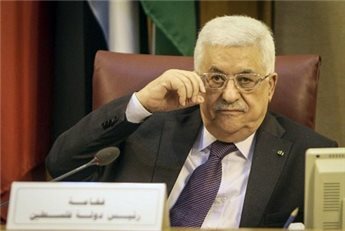 During a televised speech kicking off two days of PLO Central Council meetings in Ramallah, Abbas reasserted that he would be willing to extend negotiations with Israel if it pledged to freeze settlement construction and release the last round of prisoners as agreed at the beginning of the talks. Israel has dismissed the conditions. "Without Jerusalem there will be no negotiations," Abbas added, pledging also that the Palestinians would never recognize Israel as a "Jewish state." He applauded the efforts of US Secretary of State John Kerry, with whom Abbas said he met 40 times during the past nine months. "He was serious and he put in a huge effort, but unfortunately without results." With regards to Wednesday's reconciliation deal with Hamas, Abbas said the unity government would recognize Israel and renounce violence. "The upcoming government will obey my policy," he said. "I recognize Israel and reject violence and terrorism, and recognize international commitments." Abbas spoke ahead of Palestinian crisis talks expected to focus on US peace efforts and the unity deal. Wednesday's PLO-Hamas deal infuriated Israel, which said it would "not negotiate with a Palestinian government backed by Hamas, a terror organization that calls for the destruction of Israel," and vowed unspecified "measures" in response. The PLO recognized Israel's right to exist in 1988, but say that recognizing Israel as a "Jewish state" could jeopardize the right of return for Palestinian refugees and limit the rights of Palestinian citizens of Israel. A man was shot and injured by unidentified gunmen in Khan Younis in the southern Gaza Strip early Saturday, police told Ma'an. Gaza police spokesman Ayyub Abu Shaar told Ma'an that a man was hit in the foot and taken to Nasser Hospital. 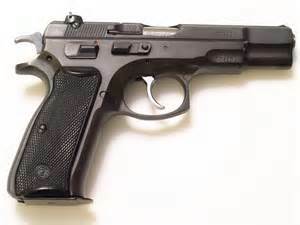 The gunmen fired from a red car, Shaar said. Imagine a war breaking out between Israel and Jordan. Within two or three days the Israeli army occupies the entire territory of the Hashemite Kingdom. What will be the first act of the occupation authority? Establish a settlement in Petra? Expropriate land near Aqaba? No. The very first thing will be to decree that the territory will henceforth be known as “Gilead and Moab”. All the media will be ordered to use the biblical name. All government and court documents will adopt it. Except for the radical Left, nobody will mention Jordan anymore. All applications by the inhabitants will be addressed to the Military Government of Gilead and Moab. Why? Because annexation starts with words. Words convey ideas. Words implant concepts in the minds of their hearers and speakers. Once they are firmly established, everything else follows. The writers of the Bible already knew this. They taught “Death and life are in the power of the tongue, and they that love it shall eat the fruit thereof.” (Proverbs 18:21). For how many years now have we been eating the fruit of “Judea and Samaria”? When Vladimir Putin last week restored the old name of “New Russia” to the territory of East Ukraine, it was not just a semantic change. It was a claim for annexation, more powerful than a salvo of cannon shots. Recently I listened to a speech by a left-wing politician, and was disturbed when she spoke at length about her struggle for a “political settlement” with the Palestinians. When I remonstrated with her, she apologized. It was a slip of the tongue. She had not meant it that way. In Israeli politics, the word “peace” has become poison. “Political settlement” is the vogue term. It is meant to say the same. But of course, it doesn’t. “Peace” means much more than the formal end of warfare. It contains elements of reconciliation, of something spiritual. In Hebrew and Arabic, Shalom/Salaam include wellbeing, safety and serve as greetings. “Political settlement” means nothing but a document formulated by lawyers and signed by politicians. The “Peace of Westphalia” put an end to 30 years of war and changed the life of Europe. One may wonder whether a “Political settlement of Westphalia” would have had the same effect. When the Israeli Left gives up the term Peace, this is not a tactical retreat. It is a rout. Peace is a vision, a political ideal, a religious commandment, an inspiring idea. Political Settlement is a subject for discussion. Peace is not the only victim of semantic terrorism. Another is, of course, the West Bank. All TV channels have long ago been ordered by the government not to use this term. Most journalists in the written media also march in step. They call it “Judea and Samaria”. “Judea and Samaria” means that the territory belongs to Israel, even if official annexation may be delayed for political reasons. “West Bank” means that this is occupied territory. By itself, there is nothing sacred about the term “West Bank”, which was adopted by the Jordanian ruler when he illegally incorporated the area in his newly extended kingdom. This was done in secret collusion with David Ben-Gurion, Israel’s first Prime Minister, who wanted to erase the name “Palestine” from the map. The legal basis was a phony conference of Palestinian “notables” in Jericho. King Abdallah of Jordan divided his fief into the East Bank (of the Jordan river) and the West Bank. So why do we insist on using this term? Because it means that this is not a part of Israel, but Arab land that will belong – like the Gaza Strip – to the State of Palestine when peace (sorry, a Political Settlement) is achieved. Until now, the semantic battle remains undecided. Most Israelis talk about the “West Bank”. “Judea and Samaria” has remained, in common parlance, the realm of the settlers. The settlers, of course, are the subject of a similar semantic battle. In Hebrew, there are two terms: Mitnahalim and Mityashvim. They essentially mean the same. But in common usage, people use Mitnahalim when they mean the settlers in the occupied territories, and Mityashvim when they speak about settlers in Israel. The battle between these two words goes on daily. It is a fight for or against the legitimacy of the settlement beyond the Green Line. Up to now, our side seems to have the upper hand. The distinction remains intact. If someone uses the term Mityashvim, they are automatically identified with the political Right. The Green Line itself is, of course, the leftist concept. It makes a clear distinction between Israel and the occupied territories. The color comes from the fact that this border – actually the 1949 armistice line – was always marked on the maps in green. Until. Until the (left-wing) Minister of Labor, Yigal Alon, decreed that henceforth the Green Line would no longer be marked on any map. Under an old law dating back to the British Mandate, the government owns the copyright for all maps printed in the country, and the Minister of Labor was in charge. This remained so until Gush Shalom sued the government in the Supreme Court. Our argument was that since on the two sides of this line different laws apply, the citizens must have a map that shows them what law they have to obey at a given place. The ministry gave in and promised the court that it would print maps with the Green Line marked. For lack of an alternative, all Israelis use the term “Green Line”. Since Rightists do not recognize this line at all, they have not invented an alternative word. For some time they tried the term “Seam-Line”, but this did not catch on. A line between what? At the beginning of the occupation, the question arose what to call the areas just conquered. We of the peace camp called them, of course, “occupied territories”. The Right called them “liberated territories” and floated the slogan “Liberated territories will not be returned”, a catchy rhyme in Hebrew. The government called them “administered territories” and later “disputed territories”. The general public just settled for “the territories” – and that is the term used nowadays by everybody who has no interest in stressing his or her political conviction every time these areas are mentioned. This raises the question about the Wall. When the government decided to create a physical obstacle between Israel and the Occupied Territories, a name was needed. It is built mainly on occupied land, annexing in practice large areas. It is a fence in open areas, a wall in built-up ones. So we simply called it “the Wall” or “the Fence”, and started weekly demonstrations. The “Wall/Fence” became odious around the world. So the army looked around for a term that sounded non-ideological and chose “separation obstacle”. However, this term now appears only in official documents. With whom are we negotiating about the Political Settlement? Ah, there is the rub. For generations, the Zionist movement and the State of Israel denied the very existence of a Palestinian people. In the 1993 Oslo Agreement, this idiotic pretense was dropped and we recognized the PLO as the “representative of the Palestinian people”. But the Palestinian state was not mentioned, and until this very day our government abhors the terms “Palestinian state” or “State of Palestine”. Even today the term “Palestinians” evokes conscious or unconscious rejection. Most commentators speak about a political settlement with “our neighbors” – by which they do not mean the Egyptians, Jordanians, Syrians or Lebanese, but You Know Who. In Oslo, the PLO negotiators strenuously insisted that their new state-in-the-making should be called the “Palestinian National Authority”. The Israeli side vehemently objected to the word “National”. So the agreement (actually a “Statement of Principles”) calls it the “Palestinian Authority” and the Palestinians themselves call it the “Palestinian National Authority”. Palestinians who need urgent medical treatment in Israeli hospitals are turned back if they bring financial documents signed by the “Palestinian National Authority”. So the fight goes on along the semantic front. For me, the really crucial part is the fight for the word Peace. We must reinstate it as the central word in our vocabulary. Clearly, loudly, proudly. - Uri Avnery is an Israeli writer and peace activist with Gush Shalom. He contributed this article to PalestineChronicle.com. Chairman of Hamas's political bureau, Khaled Mishaal, praised head of Tunisia's Islamist movement Al-Nahda Sheikh Rashid Ghannouchi's efforts in achieving Palestinian national reconciliation. In a telephone conversation, Mishaal briefed Sheikh Ghannouchi on the latest Palestinian developments, praising his efforts in bringing together the Fatah and Hamas movements. 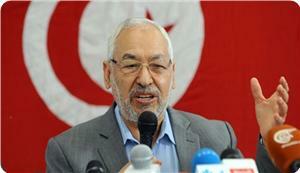 For his part, Palestinian ambassador in Tunisia Salman al-Herfi praised Sheikh Ghannouchi's role in achieving Palestinian reconciliation. For his part, Sheikh Ghannouchi congratulated Mishaal and Herfi for the success of Palestinian reconciliation, stressing the importance of national unity. He said that internal division does not serve the Palestinian cause. Gaza premier and deputy chairman of Hamas Ismail Haneyya declared on Wednesday that the Palestinian internal division was over after an agreement was reached on implementing previous reconciliation agreements and forming a national unity government. Gaza premier Ismail Haneyya reached PA chief Mahmoud Abbas over the phone on Friday night and urged him to expedite implementation of the reconciliation agreement. Haneyya said that the agreement should be carried out according to the agreed upon timetable for each step, calling for providing a financial and political safety network to protect the reconciliation. He also asked for starting confidence-building measures in the West Bank and Gaza Strip, and refused any foreign pressures against implementation of the agreement. Abbas and Haneyya exchanged congratulations on the signing of the reconciliation agreement and appreciated the “accomplishment”. Meanwhile, Rami Al-Hamdullah, the premier of the Ramallah government, offered his government’s resignation on Friday only two days after the signing of the reconciliation agreement. He told Abbas in a message published by WAFA news agency that his resignation was meant to facilitate the implementation of the reconciliation agreement. The PLO and Hamas signed an agreement in Gaza on Wednesday, based on previous agreements, ending seven years of internal division and paving the way before formation of a national unity government. The Cairo and Doha agreements for national reconciliation had stipulated among other things that Abbas would lead the unity government that would be entrusted with restructuring security apparatuses, preparing for presidential and general elections, rebuilding Gaza Strip, and solving all administrative and civil problems that had arisen as a result of the division. The PLO was preparing Friday for weekend crisis talks to mull its options after Israel torpedoed the US-sponsored peace talks in response to a Fatah-Hamas reconciliation deal. With the peace process that US Secretary of State John Kerry has fought long and hard for apparently back to square one just days before an April 29 deadline, both sides were considering their next move. Israeli Prime Minister Benjamin Netanyahu set the tone, telling the BBC that Palestinian president Mahmoud Abbas could "have peace with Israel or a pact with Hamas (but) he can't have both." "As long as I'm prime minister of Israel, I will never negotiate with a Palestinian government that is backed by Hamas terrorists that are calling for our liquidation," he added. US President Barack Obama, whose administration dragged both sides back to the negotiating table last July after a three-year hiatus, called the Palestinian unity deal "unhelpful." Speaking in Seoul, Obama acknowledged the need for a "pause," but vowed he would not give up on Kerry's peace push. Kerry himself urged both sides to "compromise," maintaining that "we will never give up our hope or our commitment for the possibilities of peace." US State Department spokeswoman Jen Psaki said "we're in a holding period to see what the parties are willing to figure out about what's next." 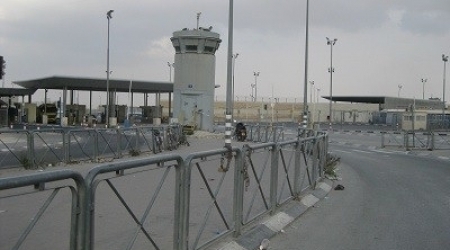 The two sides have been on a collision course since March when Israel refused to release a final batch of Palestinian prisoners in line with the original deal on resuming the talks. The Palestinians retaliated by applying to adhere to 15 international treaties and then Abbas, who heads the Palestinian Authority (PA) and Fatah, listed conditions for extending the talks beyond the April 29 deadline. Abbas said he would agree to an extension if Israel freezes settlement construction in the occupied West Bank and annexed East Jerusalem, frees the prisoners and begins discussions on the future borders of a promised Palestinian state. At the same time, the Islamist Palestinian movement Hamas and the Fatah-led PLO agreed to establish a "national consensus" government under Abbas within weeks. The reconciliation deal infuriated Israel whose security cabinet said Thursday it would "not negotiate with a Palestinian government backed by Hamas." It also vowed unspecified "measures" in response. The PLO leadership is to convene on Saturday in the West Bank city of Ramallah to debate the peace process and its options, with Abbas due to make a key speech on Sunday. Israel's chief negotiator Tzipi Livni stressed Thursday night that Israel was not "closing the door" on the peace process and that punitive sanctions would not be severe or seek to collapse the PA.
Security coordination is one aspect of Israeli ties with the PA that could be impaired by new measures. But according to Israeli newspaper Maariv, "no guidelines have been issued to the forces on the ground regarding a change in the existing security coordination policy with the PA."
The Gaza Strip -- ruled by Hamas while Abbas's writ is confined to the West Bank -- has been besieged by Israel since 2006. The coastal enclave is in a dire humanitarian and economic situation, which pushed it towards signing the deal with PLO, despite refusing to recognize Israel and advocating armed struggle against it. 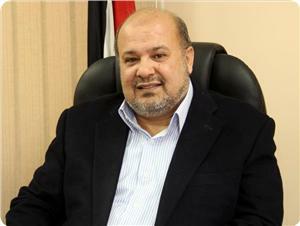 Delegates from Hamas are expected to attend the weekend PLO meeting. Ahead of the meeting, Prime Minister Rami Hamdallah told Abbas Friday he would resign if the president deemed it necessary for the formation of the new unity government. Hamdallah, who twice in 2013 sought to resign following power struggles, sent Abbas a letter offering his resignation, official Palestinian news agency Wafa reported. The Palestinian Authority (PA)’s chief negotiator says the Palestinian resistance movement Hamas is not a terrorist organization. Saeb Erekat said in an interview on Friday that Hamas does not need to recognize the Israeli regime as long as Tel Aviv does not recognize the state of Palestine. “Hamas is not and will never be a terrorist organization to us,” Erekat said, adding, “Hamas is not required to recognize Israel,” because the state of Palestine is not recognized by Israeli Prime Minister Benjamin Netanyahu and other Israeli authorities. 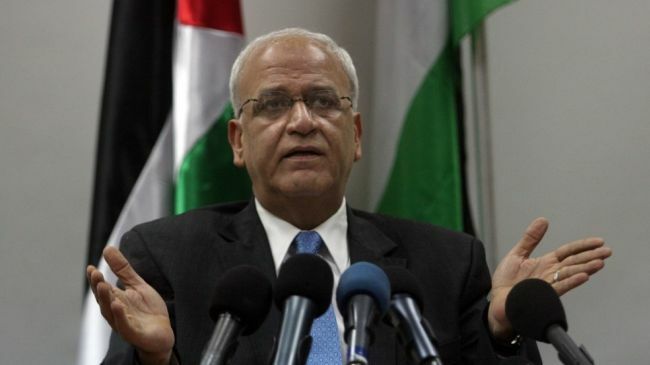 Erekat’s remarks come as the Israeli regime is angered by a deal reached between the PA and Hamas on Wednesday to form a unity government within five weeks. 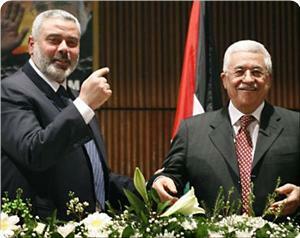 The Israeli regime says the PA must choose between the so-called peace talks with Tel Aviv and Hamas. Last Palestinian-Israeli talks broke down in September 2010, after Tel Aviv refused to freeze its settlement activities in the occupied West Bank. Palestinians are seeking to create an independent state on the territories of the West Bank, East al-Quds (Jerusalem), and the besieged Gaza Strip and are demanding that Israel withdraw from the occupied Palestinian territories.